Alzheimer disease (AD) is among the most common brain disorders affecting the elderly population the world over, and is projected to become a major health problem with grave socio-economic implications in the coming decade (1a, 1b). Alzheimer’s disease arises in large part from the body’s inability to clear these naturally occurring proteins. As amyloid beta levels increase, they tend to aggregate and contribute to the brain “plaques” found in Alzheimer’s disease. There are still no effective treatments to prevent, halt, or reverse Alzheimer’s disease, but research advances over the past three decades could change this gloomy picture. Genetic studies demonstrate that the disease has multiple causes (2). Interdisciplinary approaches have been used to reveal the molecular mechanism of the disease including; biochemistry, molecular and cell biology and transgenic mice models. Progress in chemistry, radiology, and systems biology is beginning to provide useful biomarkers, and the emergence of personalized medicine is poised to transform pharmaceutical development and clinical trials. However, investigative and drug development efforts should be diversified to fully address the multifactoriality of the disease (2). A nice research review shows for example, the effects of cancer drugs on AD treatment (3). 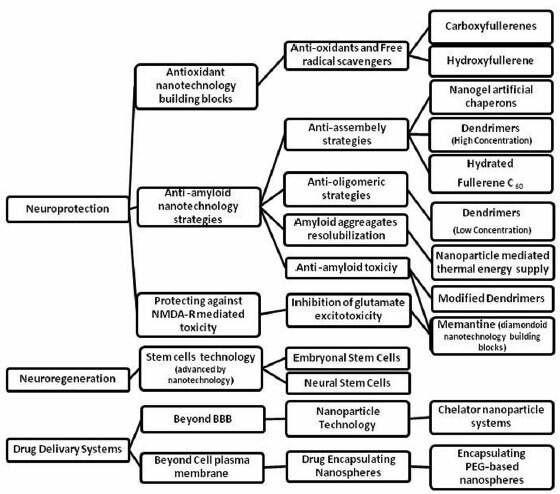 that he development of nanotechnology approaches for early-stage diagnosis of AD is quite promising but acknowledge that scientists are still at the very beginning of the ambitious project of designing effective drugs and methods for the regeneration of the central nervous system (4). Figure 1- Nanotechnology solutions of AD. These inclued: neuroprotections against oxidative stress anti-amyloid therapeutics, neuroregeneration and drug delivery beyond the blood brain barrier (BBB) are discussed and analyzed. All of these applications could improve the treatment approach of AD and other neurodegenerative diseases. The diagnosis of AD during life remains difficult and a definite diagnosis of AD relies on histopathological confirmation at post-mortem or by cerebral biopsy. An early clinical diagnosis can be made if patients are tested by trained neuropsychologists. The great problem is not that mild cognitive impairment (MCI) cannot be diagnosed, but that the patients do not see doctor until severely affected (5). During the last decade, research efforts have focused on developing cerebrospinal fluid (CSF) biomarkers for AD. The diagnostic performance of the CSF biomarkers: Tau protein, the 42-amino acid form of beta amyloid (Aβ42) and Amyloid Precursor Protein are of great importance. One possible biomarker for Alzheimer’s is amyloid beta-derived diffusible ligands (ADDL). The correlation of CSF ADDL levels with disease state offers promise for improved AD diagnosis and early treatment. Singh et al have developed ADDL-specific monoclonal antibodies with an ultrasensitive, nanoparticle-based protein detection strategy termed biobarcode amplification (BCA) (5). The BCA strategy used by Klein, Mirkin and coworkers makes clever use of nanoparticles as DNA carriers to enable millionfold improvements over ELISA sensitivity. CSF is first exposed to monoclonal anti-ADDL antibodies bound to magnetic microparticles. After ADDL binding, the microparticles are separated with a magnetic field and washed before addition of secondary antibodies bound to DNA:Au nanoparticle conjugates. These conjugates conatin covalently bound DNA as well as complementary “barcode” DNA that is attached via hybridization. Unreacted antibody:DNA:Au nanoparticle conjugates are removed during second magnetic separation, after which elevated temperature and low-salt conditions release the barcode DNA for analysis. Presently there exist no therapeutic methods available for curing AD . The cure for AD would require therapeutics that will cease the disease progress and will reverse its resultant damages. Today, common medications for AD are symptomatic and aim at the disrupted neurotransmission between the degenerated neurons. Examples of such medications are acetylcholine esterase inhibitors, including tacrine, donepezil, rivastigmine and galantamine (4). Oxidative stress and amyloid induced toxicity are two basic toxicity processes in AD pathogenesis. Fullerene is a nanotechnology building block and can be used to design neuroprotective compounds. It’s chemical structure is known for it’s anti-oxidative and free-scavenger potentials. Applications of functionalized fullerene derivatives including carboxyfullerene and hydroxyfullerene (fullerenols), are promising in discovery of new drugs for AD; however further research on their pharmacodynamic and pharmacokinetic properties is necessary. AD is a very common disease worldwide, Solving the major problems of early diagnosis and effective cure for AD requires interdisciplinary research efforts. Research on the basic pathogenetic mechanisms of the disease has provided new insight for designing diagnostic and therapeutic methods. Nanotechnology has great potential in aiding and providing tools for diagnosing and treating AD. However, these research combining nanotechnology is still at very early stages and continuous understanding of the disease, neuronal protection and regeneration are needed in order to alleviate the symptoms of the disease. 1b D.A. Davis, W. Klein and L. Chang, “Nanotechnology-based Approaches to Alzheimer’s Clinical Diagnostics”, Nanoscape, 3 (2006) 13-17. 2. Huang Y and Mucke L. Alzheimer mechanisms and therapeutic strategies. Cell. 2012 Mar 16;148(6):1204-22. 4. Amir Nazem1, G. Ali Mansoori. Nanotechnology solutions for Alzheimer’s disease: advances in research tools, diagnostic methods and therapeutic agents. J Alzheimers Dis. 2008 Mar;13(2):199-223. http://www.ncbi.nlm.nih.gov/pubmed/18376062?dopt=Abstract. 5. Shinjini Singh, Mritunjai Singh, I. S. Gambhir*. Nanotechnology for Alzheimer’s Disease Detection. Digest Journal of Nanomaterials and Biostructures Vol. 3, No.2, June 2008, p. 75 – 79 .